Now part of the Hawkesbury Regional Museum, Howe House was built for John Howe, who arrived as a free settler on the Coromandel (1802). In 1809 he came to Windsor to manage the business and farming interests of the district's most prominent citizen, ex-convict Andrew Thompson. After Thompson's death in 1810, Howe took over many of Thompson's affairs, and the house was both the Howe family residence and the headquarters of various enterprises, including major engineering projects and exploration. Howe also took over Thompson's roles as Government Appraiser, Chief Constable and Coroner. The house is situated on a land grant made by Governor Macquarie in 1811, and was visited by two later governors, Gipps and FitzRoy. It witnessed the catastrophic flood of 1867, served as a newspaper office and an inn, and for 40 years welcomed visitors to the Hawkesbury through its role as a community museum and visitor information centre'. The basement, which was the original house before it was flooded, and also served as the servants quarters and kitchen. The ground floor, which has a few different rooms, including the drawing room and a room thought to be a smoking room for gentlemen. The upper floor, also with bedrooms/nursery’s etc. The former mortuary (or dead house) building provided temporary storage for the bodies of those who had died in the adjacent hospital, prior to removal for burial by the family of the deceased or undertaker. In the case of an unexpected or suspicious death the body often needed to be held for a longer period to enable an inquest into the death to be held and the local coroner to pass judgement on the cause. The building continued to be used as the hospital mortuary until the construction of a larger facility in the 1940s.Initial research in 2004 indicated that the structure of this building may have survived from the 1824 conversion from convict barracks to hospital in which a number of outbuildings including kitchen, overseer’s quarters, and privy (toilet) were added to the site. Marked on the original plan dated 1823 as the ‘dissecting room’ this building would have been used to conduct an autopsy to determine the cause of death of a person. More recent archaeological investigations in 2010 have revealed that the surviving fabric of the 1824 structure includes the footings and part of the original step only. 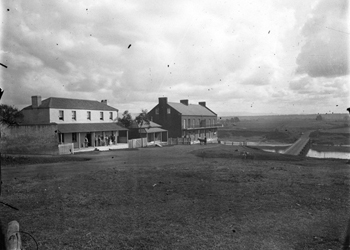 During the period c. 1850–1870 the building was reconstructed for use as a mortuary upon the original foundations using a mixture of new and recycled materials. This building had no ceiling and was originally illuminated by two skylights in the roof as shown by surviving framework. Between 1911 and 1919 a partition was installed dividing the building into two sections. The larger portion was used as a store with the smaller mortuary section accessed from the outside by two sliding doors. The line of this partition may still be seen in the floor and two sections of the timber ceiling. A concrete floor was laid at this time covering the earlier bricks and plaster and render was used to cover the lime washed interior walls. Conservation works carried out on the building in 2010 included underpinning one of the walls to stabilise the structure, combating rising damp, reinstating exterior render and lime wash and reopening the concealed window.